I think pity is the emotion that the totally admirable Tsuha-san feels for me. She is older than me, which means she grew up in immediate post war Okinawa. It is difficult to imagine what her childhood was like. Anyway, she is happy, never has a negative word and considers what is said to her carefully before forming a response. She and her husband come to my house every second Monday to clean it. She cooks me food and brings it to my house as she believes that my pitiful attempts to feed myself will lead to premature death. This morning she brought me an Okinawan salad of okra, tomato and shavings of dried tuna. 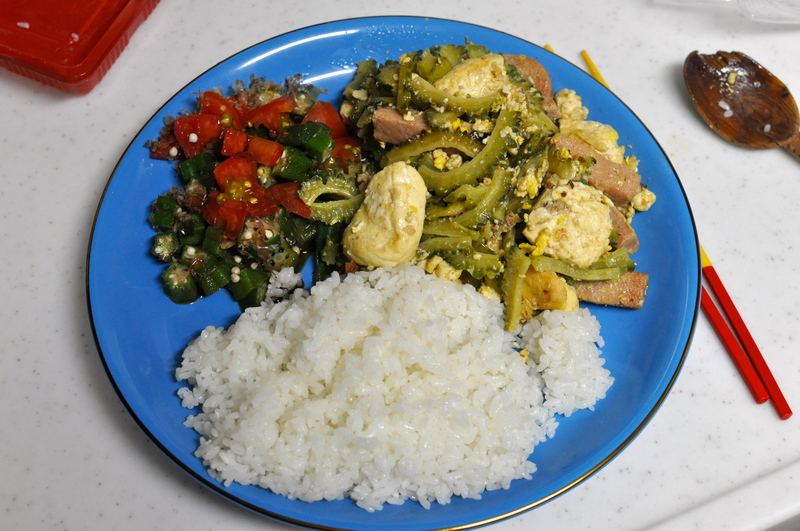 The main course is goya champuru, a dish of goya, tofu, eggs and Spam. Of course there is rice. Remember Tsuha-san and her family in your prayers, please. This entry was posted in Uncategorized and tagged Battle of Okinawa, goya, pity, spam. Bookmark the permalink. 1 Response to The Usual Fortune of Complaint Is to Excite Contempt More than Pity. Hello there, I discovered your web site by the use of Google while looking for a related topic, your website came up, it seems to be great. I have bookmarked it in my google bookmarks.